An enchantress disguised as an old beggar woman offers a young prince a rose in exchange for a night's shelter. When he turns her away, she punishes him by transforming him into an ugly Beast and turning his servants into furniture and other household items. She gives him a magic mirror that will enable him to view faraway events, and she gives him the rose, which will bloom until his twenty-first birthday. He must love and be loved in return before all the rose's petals have fallen off, or he will remain a Beast forever. Years later, a beautiful young woman named Belle comes along, living in a nearby French village with her father Maurice, an inventor. Belle loves reading and yearns for a life beyond the village. Her beauty attracts attention in the town and she is pursued by many men, but mostly the arrogant local hunter, Gaston, although Belle has no interest in him, despite the fact that he is sought after by all the single females and is considered godlike in perfection by the male population of the town. As Maurice travels to a fair, he gets lost on the way and is chased by wolves before stumbling upon the Beast's castle, where he meets the transformed servants Lumière (a candelabra), Cogsworth (a clock), Mrs. Potts (a teapot), and her son Chip (a teacup). The Beast imprisons Maurice, but Belle is led back to the castle by Maurice's horse and offers to take her father's place which the Beast agrees to. While Gaston is sulking over his humiliation in the tavern, Maurice tells him and the other villagers what happened but they think he has lost his mind. At the castle, the Beast orders Belle to dine with him, but she refuses, and Lumiere disobeys his order not to let her eat. After Cogsworth gives her a tour of the castle, she finds the rose in the forbidden West Wing and the Beast angrily chases her away. Frightened, she tries to escape, but she and her horse are attacked by wolves. After the Beast rescues her, she nurses his wounds, and he begins to develop feelings for her. 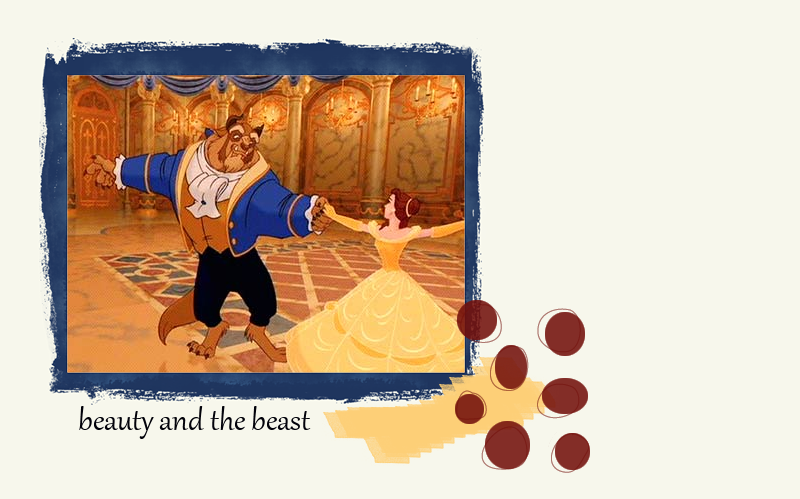 The Beast grants Belle access to the castle library, which impresses Belle and they become friends, growing closer as they spend more time together. Meanwhile, the spurned Gaston pays the warden of the town's insane asylum to have Maurice committed unless Belle agrees to Gaston's marriage proposal. Back at the castle Belle and the Beast share a romantic evening together. Belle tells the Beast she misses her father, and he lets her use the magic mirror to see him. When Belle sees him dying in the woods in an attempt to rescue her, the Beast allows her to leave to rescue her father, giving her the mirror to remember him by. As he watches her leave, the Beast admits to Cogsworth that he loves Belle. Belle finds her father and takes him home. Gaston arrives to carry out his plan, but Belle proves Maurice sane by showing them the Beast with the magic mirror. Realizing Belle has feelings for the Beast, Gaston arouses the mob's anger against the Beast, telling them that the Beast is a man-eating monster that must be brought down immediately, and leads them to the castle. Gaston locks Belle and Maurice in the basement, though Chip, who had hidden himself in Belle's baggage, uses one of Maurice's inventions to free them. While the servants and Gaston's mob fight in the castle, Gaston hunts down the Beast. The Beast is initially too depressed to fight back, but he regains his will when he sees Belle returning to the castle with Maurice. After winning a heated battle, the Beast spares Gaston's life, demanding that he leave the castle and never return. As the Beast is about to reunite with Belle, Gaston, refusing to admit defeat, stabs the Beast from behind, but loses his balance and falls off the balcony to his death. Just as the Beast succumbs to his wounds, Belle whispers that she loves him, breaking the spell just as the rose's last petal falls. The Beast comes back to life, his human form restored. As he and Belle kiss, the castle and its inhabitants return to their previous states as well. Belle and the prince dance in the ballroom with her father and the humanized servants happily watching.